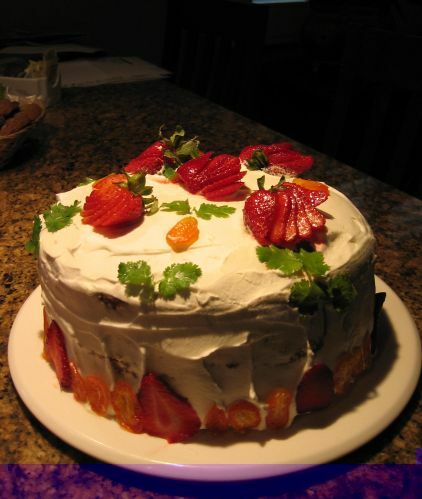 Hoa's been asking "how come you never bake a cake?" Hmm, that's right come to think of it, I never did! Why you might ask? Very simple answer! I like the cake part but I never like the cream filling in a cake. Most of the time they are just too sweet for my taste. 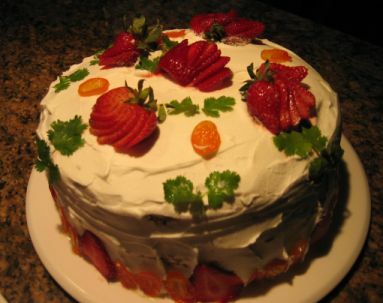 But I decide to bake a cake anyway.. After opening my cookbooks collection, there are gazillion of cakes to pick from! I decided to pick a cake with a whipped cream base and not butter base (way too sweet). 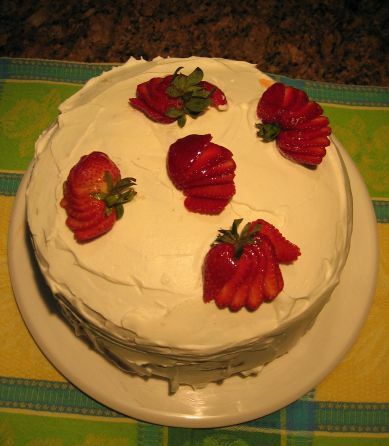 In the end, I opted for a Berry Crème Fraîche cake from Emily Luchetti's "a passion for Dessert". I found out that decoration a cake is not that easy. Spreading the cream smoothly does take some experience. I also found out the recipe did not generate enough cream.. I wanted to pipe some design on top of the cake but I ran out of cream. The cake turned out to be very moist and very good. Next time I will definitely will make more cream so I can put more in between the layers. 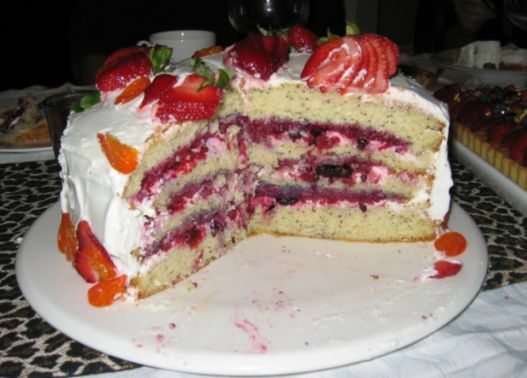 The result is a really good cake, not too sweet and the berries and the cream compliment well the poppy cake. This recipe is a keeper! What attracted me to this recipe is the use of poppy seed in the batter. 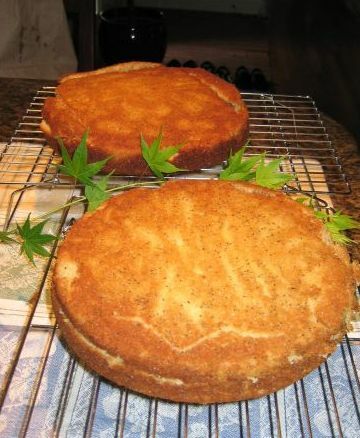 It is not very often you will find a cake recipe with poppy seed. 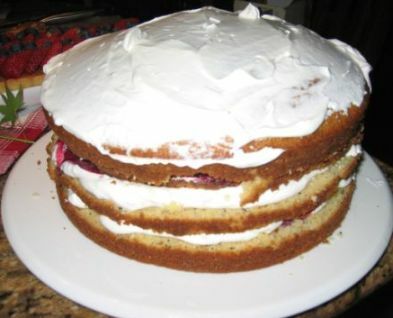 Here I just assembled the 4 layers of cakes and I am frosting the top of the cake. I was wondering if I should frost the side too?? After taking a look at it, I definitely need to cover the sides.! 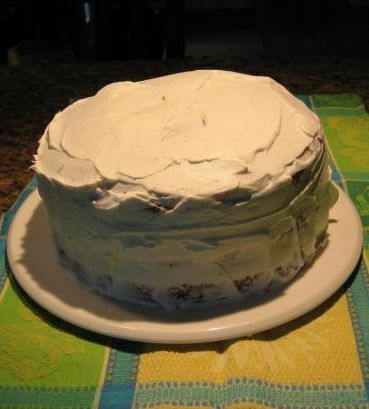 I found out from Mai-Ly that in order to make the frosting perfect I needed to refrigerate the cake and put on a second layer after the first layer of cream has stiffen a bit. I needed something to decorate the cake so I put a few strawberries on top. Here is a recap of the all the desserts I made for the evening! Chocolate chips cookies for the kids, Berry Crème Fraîche Cake, Strawberries Tart with almond filling and finally the Kumquats Tart with Pastry cream filling. 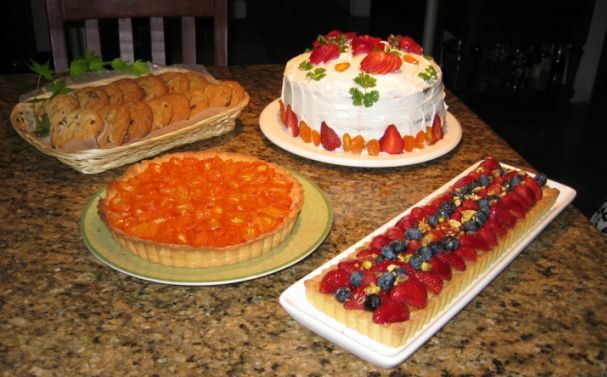 Are you wondering how long it took me to bake all of these desserts? A little more than 4 hours. I know it is a lot of time but it is really worth it!